100% Peated Whisky Mash - Fresh Wort Kit (Approx SG 1060 Alc 7.4%) Made with 100% Scottish Heavy Peated malt. Mashed at a low temp of 63 Deg C to produce a highly fermentable wort. The wort has been given a short boil with no additions of hops. Designed for Malt Whisky production, this wort could also be used as the base for a beer with an extreme Peat character. Note: Contains no hops. is a full flavoured brown ale similar in style to James Squire Amber Ale. New Release version with Citra hops. This easy drinking ale is a blend of Aussie Pilsner and Wheat malt with a touch of Carahell. Citra hops are added late in the boil for a subtle citrus,tropical fruit and pine flavour and aroma. We recommend dry hopping with 20 to 30g of Citra hops for a hoppier aroma. Recommended dry yeast - American Ale (US-05) or liquid Wyeast 1056. Bacchus American Pale Ale - Fresh Wort Kit (Approx SG 1048 Alc 4.8%). Classic West Coast American Pale Ale. Now comes with a 60 gram Dry Hop Pack. A combo of Simcoe, Amarillo, Centennial. Recommended dry yeast - American Ale (US-05) or liquid Wyeast 1056.
dry hop blend of Simcoe, Mosaic & Citra. Recommended yeast - Windsor dried yeast. Bacchus Breeze Pale Ale - Fresh Wort Kit. (Approx SG 1030 - Alc 1.5%) New release. The ultimate drivers beer. Originally designed & brewed at Bacchus Brewery for drivers that wanted a full flavoured beer with minimal alcohol. The perfect beer when driving or when having a lunchtime beer & going back to work. Hopped with Amarillo, Mosaic and Simcoe to give a balanced tropical fruit and lightly piney flavour and aroma. A combo of 8 different malts give a rich amber colour with a slightly nutty malt profile. The mashing process we use along with some added lactose and a low attenuating yeast gives the finished beer a body and texture not usually found in beers of this alcohol level. Comes complete with 45 gm dry hop blend of Amarillo, Mosaic and Simcoe. Recommended yeast - Windsor dried yeast. Note: Contains Lactose. beer, proves that low alcohol beers don't have to be boring. Rich nutty malt character with subtle roast, coffee flavours. caramel & dark chocolate. We recommend dry hoping with 90gms Centeenial. Recommended dry yeast American Ale (US-05) or liquid Wyeast 1056.
taste sensation. Fantastic with spicy/BBQ foods. Recommended dry yeast - Swiss Lager (S-189) or liquid Wyeast 2308. Clarke's Sparkling Ale - Fresh Wort Kit. (Approx SG 1054. Alc 5.7%). Dave Clarke's award winning Coopers Sparkling Ale Clone is a beauty. culture the yeast from a fresh 6-pack of any Coopers Ale. A huge hoppy, malty, fruity, maroon coloured IPA originally brewed by Bacchus Brewery to celebrate Qld’s 8 in a row victories in State-of-origin. Packed full of Mosaic, Galaxy and Amarillo. This kit comes complete with a 90g Dry Hop Pack and a Craftbrewer Twin Pack of American Ale Yeast. 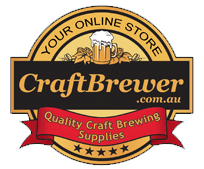 Recommended dry yeast - Craftbrewer English Blend or Wyeast 1318 London Ale III. Belgian Malts have been used to produce this award winning Belgian Dubbel. ferment, which will bring the alcohol up to approx 7.4% & give the balance required. Regular sugar (600gm) may be substituted, but won't be as good. Recommended yeast Wyeast 1214 or Wyeast 3787. Bright straw in colour with a lovely balance of malt & hop flavours. recommend dry hopping with 60 to 90 gms of East Kent Goldings. Recommended dry yeast - CraftBrewer English or liquid Wyeast 1099. No fewer than 9 malts go into our Porter, helping recreate a recipe of 1750.
maltiness & an astringency on the finish that comes entirely from the dark malts. is the 1st in a series of Golden Ales showcasing hops from around the world. This Golden Ale will benefit from dry hopping with Amarillo 20 to 30gm. Easy drinking well balanced Euro / Premium style pale lager. A balanced malty finish with subtle spicy European hopping. We have used a blend of Aussie Pilsner, Wheat and a touch of Caramalt along with Aurora hops in the kettle to give that characteristic spicy hop profile. Bittered to 26 IBU to give great balance. This is what mainstream lager should taste like. Recommended dry yeast - Swiss Lager (S-189). This rich, malty Irish Ale is a beautiful example of the style. Rich malty, biscuity, roast, coffee flavours. In the style of Kilkenny but with much greater depth of flavour it's a true crowd pleaser. Recommended dry yeast - American Ale (US-05) or liquid Wyeast 1084. Brewed to the traditional Guinness recipe this dry stout is a classic. Recommended dry yeast SO4 or liquid Wyeast 1084. This wort kit allows you to very easily make an absolutely refreshing Berliner Weisse Fruit Sour or even a Gose with that characteristic clean lactic acidity. We have taken a blend of Pilsner and Wheat malt and done our normal mashing process to produce sweet wort. We have then added a Lactobacillus culture to the wort in the kettle to produce the distinct clean lactic sourness. After reaching a pH of 3.5 we have boiled the wort with a small addition of hops to give a bitterness of just 10 IBU.Recommended yeast for neutral character: Dry-American Ale (US-05) or liquid Wyeast 1056.
with delicate German noble hops, have created this delicious session beer. Recommended dry yeast CraftBrewer German Ale or liquid Wyeast 2565. Full bodied, rich & smooth this stout is a beautiful example of the style. Recommended dry yeast Nottingham, or liquid Wyeast 1084. Bacchus Obama IPA - Fresh Wort Kit (Approx SG 1060 Alc 6.0%). One of our signature brews, this Black IPA is a hop lovers dream. Approx 300gm's of American hops crammed into this beautifully balanced ale. We recommend dry hopping with an additional 90gms Amarillo. & noble hops. Brewed as a one off, it was so good, it's now a permanent brew. Recommended dry yeast Swiss lager (S-189) or liquid Wyeast 2633.
a brewery favourite. We recommend S-23 yeast at 19c for the best result. If you don't have temperature control, use a neutral ale yeast like US-05. Aggressive, fresh, tropical flavours, brewed in the style of Brewdog's Punk IPA. Comes complete with 90gm dry hop blend of Simcoe, Nelson & Amarillo. Recommended dry yeast - CB English or liquid WY1187 Ringwood. Bacchus Queensland Ale - Fresh Wort Kit (Approx SG 1043 Alc 4.7%). ingredients - Macadamia Honey, Wattle Seed, Malt & Oats with Tasmanian hops. We recommend you dry hop this beer with 30gms of Galaxy hops. Bacchus Red Bellied Black - Fresh Wort Kit (20L) +Dark2 Candi Syrup + Simcoe 90g + CB American Twin Pk. (Approx SG 1085. Alc 10.0 % with candi syrup addition). Raise your glass to the light & this beer shows off it's beautiful red underbelly. Bucket loads of Simcoe hops give intense tropical piney aromas that lead into fruity tropical flavours with hints of honeydew melon & ginger. Dangerously sessionable, due to a unique subtle tartness derived from our secret spice ingredient. Beware it's bite!!! This kit comes complete with a bottle of Dark 2 Candi Syrup, a 90g pack of Simcoe for Dry Hopping Pack and a Craftbrewer Twin Pack of American Ale Yeast. Add both packets of yeast at the start of fermentation. Add one 500ml bottle of Belgian Dark 2 Candi Syrup 4 days into ferment, which will bring the alcohol up to approx 10.0 % ABV & give the balance required. Add 90g Simcoe for dry hop at the end of fermentation. Bacchus Sanchez Lager - Fresh Wort Kit (Approx SG 1046 Alc 4.7%). Our interpretation of the classic Mexican favourite Corona. Recommended dry yeast - Swiss Lager (S-189) or liquid Wyeast 2007. Developed from a multi award winning recipe this Schwarzbier ia a classic. Fresh roast coffee & chocolate flavours make this a firm favourite with the ladies. Recommended dry yeast - Swiss Lager (S-189) or liquid Wyeast 2124. Cherrywood smoked malts. Simply delicous. Recommended dry Yeast - Nottingham. Bacchus Vienna Lager - Fresh Wort Kit (Approx SG 1050 Alc 4.8%). Designed by our manager Anthony this golden malty lager is a winner. Recommended dry yeast - Swiss Lager (S-189) or liquid Wyeast 2206. 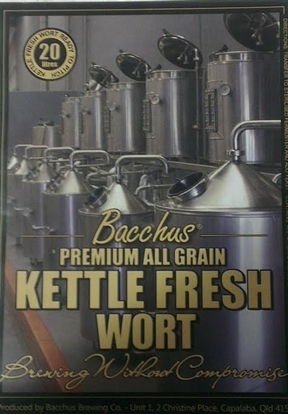 Bacchus Weizen - Fresh Wort Kit. (Approx SG 1048 - Alc 5.2%). This lovely golden Wheat beer is perfect for an American or German style wheat beer. Gently spiced with Hallertau Mittelfrueh and Sorachi Ace . Recommended dry Yeast Danstar Munich or liquid Wyeast 3068 for a German style wheat or Wyeast 1056 or Fermentis US05 for an American wheat. For a longer an interesting twist and a longer lasting banana flavour try brewing with a belgian ale yeast such as Wyeast 1214. Wow, this USA style IPA is gorgeous even if we say so ourselves. Fruity, piney & beautifully balanced, hopped with 100% Zythos hop blend.